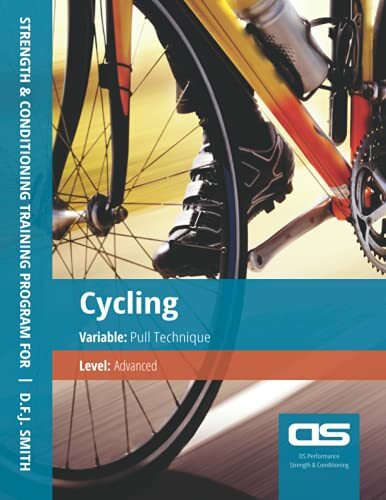 A 12 week strength &amp; conditioning training program for Cycling, focusing on pull technique conditioning for an advanced level. DS Performance have created an exclusive series of sport specific, strength &amp; conditioning training programmes that have underpinning, evidence based training methods, which have been put in place to improve your performance for all ages and abilities. All programmes have been designed to develop each specific performance variable through the progression of intensity and volume. Along with your training program this book contains a supporting guide to mobility training. This guide uses myofascial release, static stretching and activation work to mobilise the major body parts used in training. It has been put in place to increase your mobility, it can also be used to support your warm-ups and cool downs. To aid your training, we also included a series of tables to create your lifting percentages. These tables will help you work out your working percentages from 40%-95%. The tables are broken down into 5% loads, all in kilograms, ranging from 10kg-300kg All programmes by DS Performance are 12 weeks in duration, we recommend that you do two, six week training blocks, with a de-loading week between the two training blocks. This will allow the body to recover, prepare you for the second training phase and reduce any risk of injury. Cycling can cover a wide range of athletes, from the track sprinters who specialise in 10 second efforts, to the road riders who have to perform for 6 hours at a time, for multiple days. High levels of conditioning for all cyclists are becoming more then ever important to aid in the production of maximum power and performance efficiency. This is why our programmes have been designed to develop the key physical attributes for Cycling. Covering the essential physical aspects to Cycling is just as important as putting those miles in on the bike. Choose your current training level, Amateur, Intermediate and Advanced for the variable you would like to train and progress your way up to &quot;Advanced&quot; to really improve your performance. The three levels, Amateur, Intermediate and Advanced represents more your current training age, experience and skill level. Because weight training and other training methods have a completely different set of skills required when lifting and training correctly, compared to your sport. DS Performance training programmes are written to run alongside a skill/sport specific based training plan. DS Performance programmes provide sessions for 3 days of training a week, to alternate between your skill/sport specific training sessions. DS Performance has selected five of the most important physical performance variables/attributes for each of the sports that are essential in developing your performance. DS Performance strength &amp; conditioning training programmes have been written for 20 of the most popular sports globally, the sports selected have a wide range of physical attributes and together we have targeted the primary performance variables, to develop them for increases in your personal performance. DS Performance has been developed to bring elite training methods to everyone, from all levels of sporting ability. The mission of DS Performance is to make training programmes utilised by professional athletes available to all sporting enthusiasts and performers. DS Performance are providing you with training programmes designed by ex-Team GB athletes and coaching staff that have the practical and applied experience through a wide range of individual and team based sports. Combined with the vast experience an International athlete has on training and peak performance, who also are qualified to a minimum of Post Graduate level, in the form of Masters Degrees in Sport Science, Strength &amp; Conditioning. David F.J. Smith BSc MSc Strength &amp; Conditioning Coach Athlete Mentor GB Athlete David has graduated from 2 Universities with a Bachelor of Science (BSc) in Sport &amp; Exercise Science and a Master of Science (MSc) in Sport &amp; Exercise Science, through the Strength &amp; Conditioning pathway. Further, he is also qualified through the English Football Association (The FA) in the Treatment &amp; Management of Injuries. David also is a qualified tutor of the National Association of Sports Medicine (NASM) courses; Performance Enhancement Specialist (PES), Corrective Exercise Specialist (CES) and Certified Personal Trainer (CPT) bridging award. David has been offering strength and conditioning support for 10 years and skills based coaching for 15 years, which has led to him managing his own sports performance company, DS Strength &amp; Conditioning. David with his own performance company focuses on strength &amp; conditioning and biomechanical analysis mainly, but also supports athletes with rehab/prehab correctional exercise plans to provide a stronger performance development package. Working with athletes from novice to elite; David has worked with athletes and teams from such sports as Athletics, Basketball, Bobsleigh, Football, Golf, Martial Arts, Powerlifting, Rugby (both forms), Swimming, Hockey (field), Cycling, Squash, Running, Triathlon, Duathlon, Cross Training, Cross Fit, Tennis and many more. David has a strong history with his own competitive sporting background, having represented Great Britain at Bobsleigh in both the 2-man and 4-man events, competing in the Europa Cup, World Cup and World Championships. Other achievements include representing his 2 Universities in the British University Championships at Athletics and Powerlifting. David has Also Competed at national levels in Athletics for many years in the British Athletics Leagues (BAL), competing in such events as the long jump, triple jump and sprints. Furthermore David represented 2 Counties in multiple sports, and competed at a wide range of sports, including Football, Rugby, Cricket, Judo, Tennis, Athletics, Swimming and Skating at club levels. He is currently training for Sprint Track Cycling and in his first year competed at the World Masters Championships and won a silver medal in the match sprint event at the British Masters Championships.